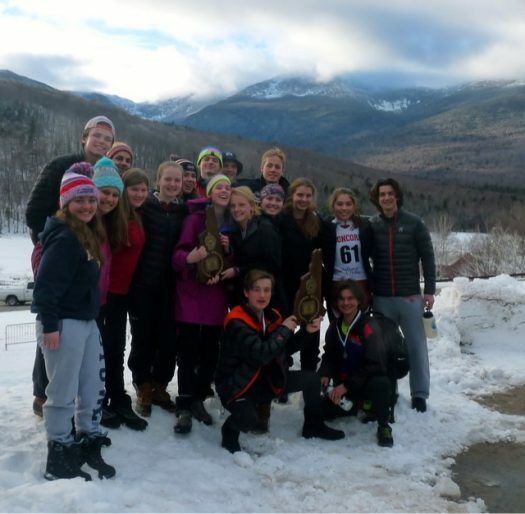 Concord High School’s coed varsity Nordic Skiing team won the 2018 Division 1 Cross-Country Ski Championships March 5, 2018, at Great Glen Trails in Gorham, New Hampshire. This victory represents the tenth consecutive championship title for the team, coached this year by Sam Evans-Brown, James Townsend and Abe Meyerhofer. Team members include: seniors Jordan Blanchard, Noemi Bordino, Michaela Hayes, Sophia Johnson, Brenna McNamara, Nathaniel Nichols, Kathryn Richards, Oliver Spencer and Antonino Tomas; juniors Cameron Brochu, Heather Deacon, Dasha Savelieva, Lauren Soper, Lucas Tomas and Johanna Van Fleet; sophomores Clara Cooper, Gavin Graham and Johanne Nichols; and freshmen Eben Bragg, Julie Deacon, Morgane Orcutt, Rafe Pollak, Aaron Russell, Kaitlyn Watt and Hannah Willette.